FOTD and random update! - Cherry Colors - Cosmetics Heaven! Today I got home after I slept over at my bf's place. We spent all evening talking (okay all night since it was from like midnight to 2am) about which camera should we get. I mean he already has enough cameras, that's why he's lending me one.. but I want one we can take with us and put it into my purse. I don't like the fact that we have to bring an extra bag with us for the cam + lenses. NOPE! So he said he'll check it out and tell me what each cam has, and of course it has to be pretty too. Canon SX200 IS. After all the data we read.. well other cameras seemed like rubbish! And after two hours we decided to get that one. I mean it's quite pricey for a small cam, but it will work perfectly for me (no more taking pictures with a cell phone and D40.. no more tripod! and more cam whoring lol) and it will be great for trips together! Now I'll finally be able to share a couple of pics of us. I'm not sure when we'll get it, but when we will... you will be the first to know! ;) Today I played around with some simple makeup, because I was trying to recreate an Ulzzang look. I think it got it quite well, tho the pictures don't show it. Why do I think so? Well because those contacts actually looked NORMAL on me with this kind of makeup :D! It's nothing special. A thick black line and over it some blueish green line. On the lower bottom another black line and on the waterline white eye pencil. 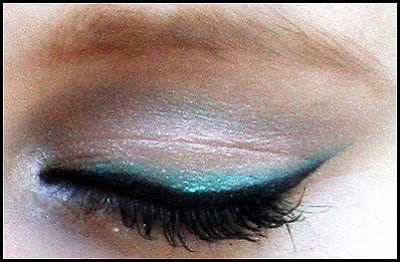 The inner corner of the eye has a bit of white eyeshadow and the full eyelid has some glittery gentle eyeshadow that I usually use for highlighting. Yesterday I also got to Piran with my dear and relatives. 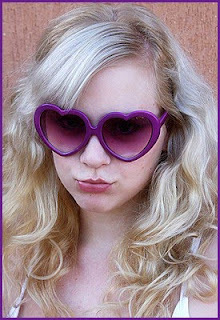 There I saw that gorgeous heart shaped purple sunglasses! 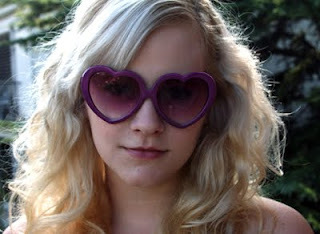 I always wanted heart shaped sunglasses. Tho I wanted them red, but when I tried them.. the purples had to go with me! Ahah, I think they are just damn adorable! 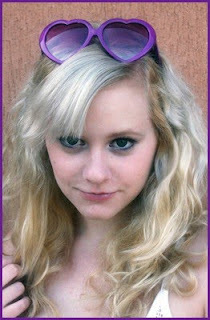 :) I have no idea when will I be wearing them, IF.. but they surely will be useful for some cam whoring! ;) Oooh right! I will write a review pretty sooner on Lunette Selene, because you girls showed so much interest in it, thanks! Have a nice day ladies! xoxo, Tamara P.S. All the pictures were taken by Parisky.